Had a very enjoyable afternoon - evening - night guiding yesterday. Met up with a mixed international group (Sweden, Denmark, Germany, France and Belgium). On the way down to the Rift Valley i intercepted a huge raptor migration stream - I had to stop and watch for a couple of minutes though I was almost late. 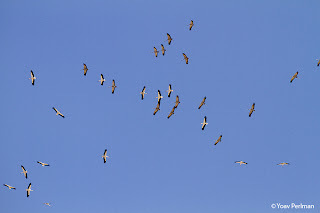 Had a couple of thousands of buzzards, with some eagles etc. 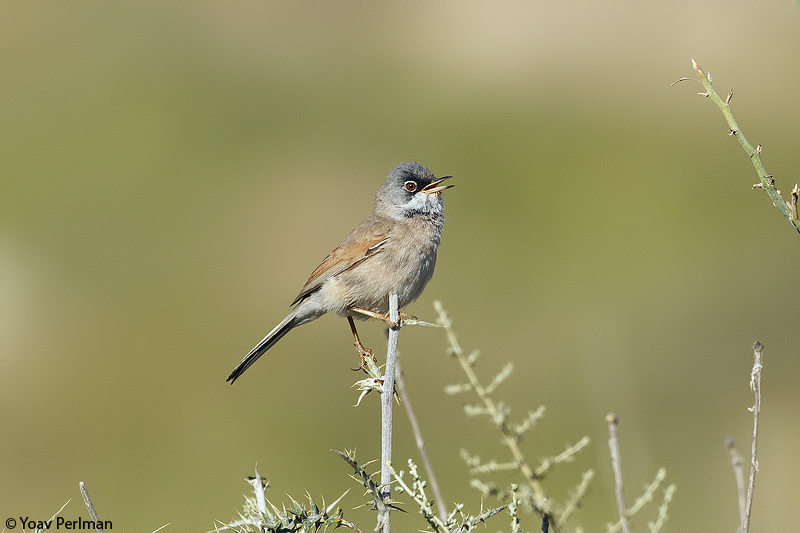 Down at neot hakikar we had a really good and relaxed hour before dusk with a nice selection of migrants and resident species - Whinchat, Wryneck, Garganeys, Marsh Sands, Montagu's Harrier, several Clamorous Reeds etc. 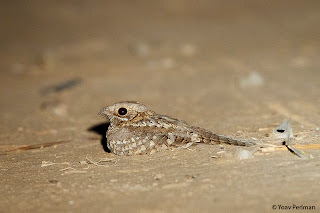 After dusk we had good views of Nubian Nightjars, enjoyed by all clients. 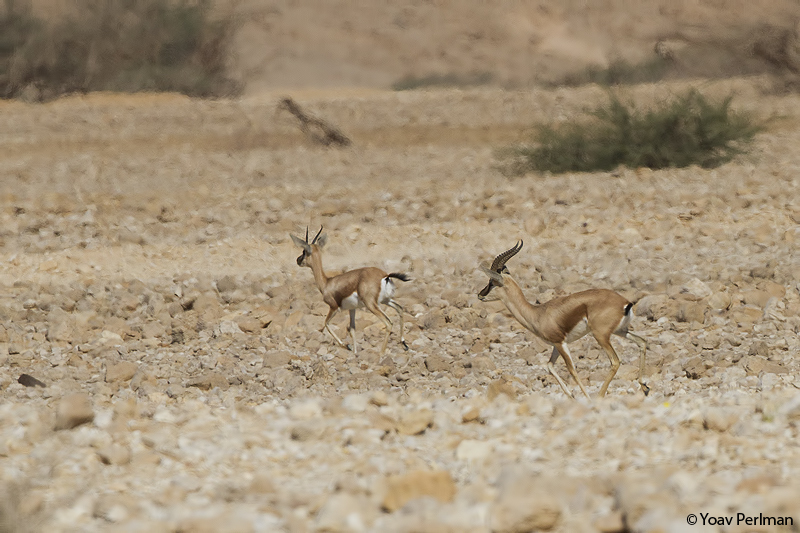 After a quick coke stop we headed into a wadi in the Judean Desert. 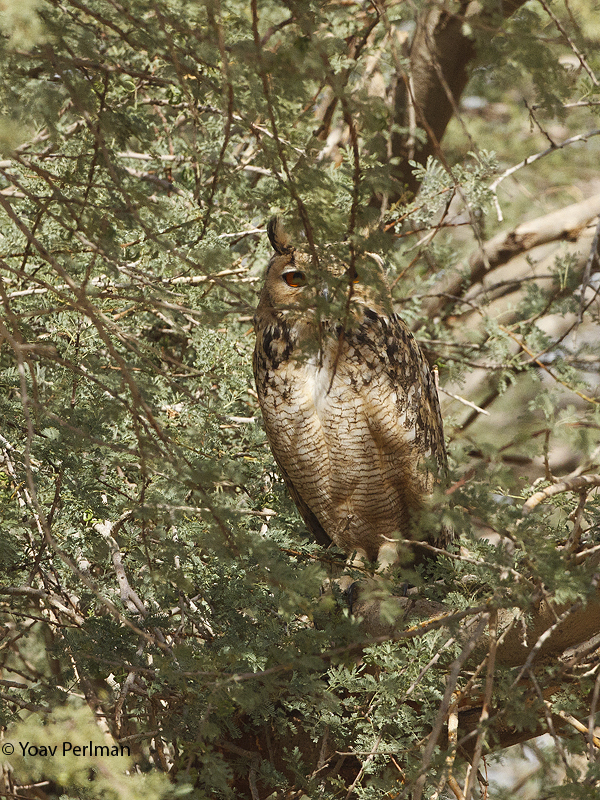 It took us some time but eventually we had great views of a male Hume's Owl, calling and flying. 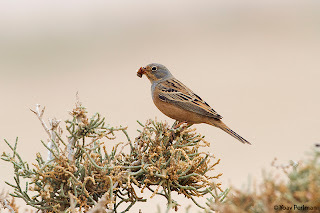 No matter how many times I've seen this bird before, each encounter is truly magical with the combination of desert, moon, sounds and sights. Unfortunately, I'm the one who normally holds the torch during these encounters, so also yesterday I was unable to get an image of the owl. 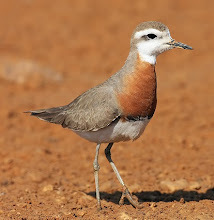 This image is from previous years from the same place, perhaps the same bird. 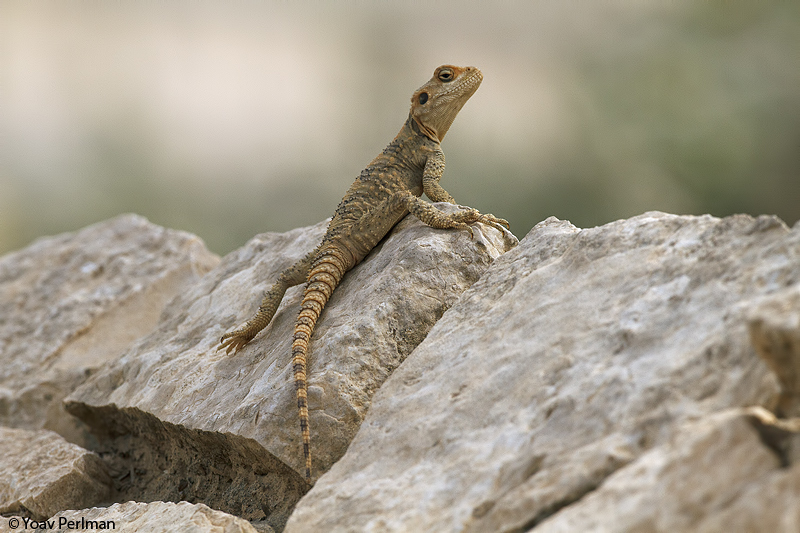 As part of my breeding atlas project of the Batha habitat in the N Negev, I checked Mt. Khiran reserve this morning, E of Meitar. 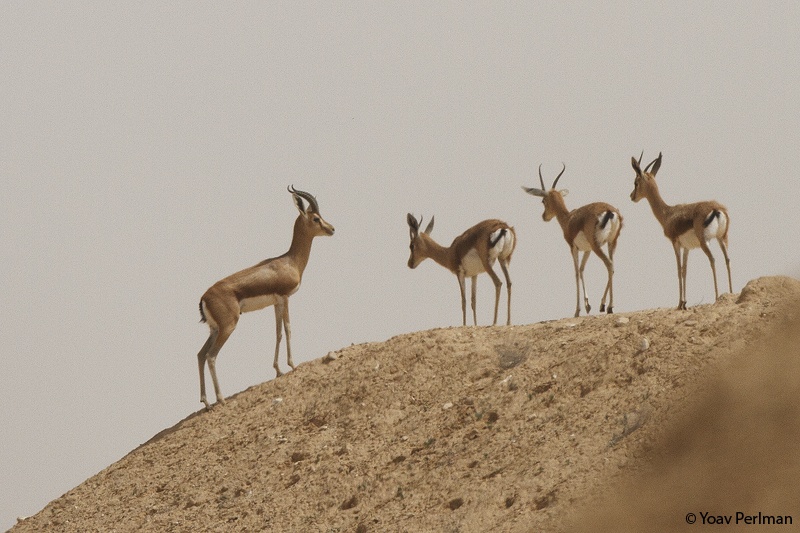 Sadly, even though it's protected as a nature reserve, habitat is strongly degraded there by overgrazing. 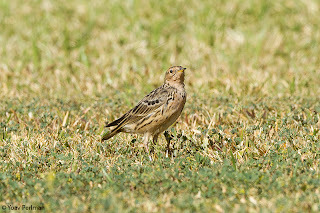 But still I managed to see some quality birds. 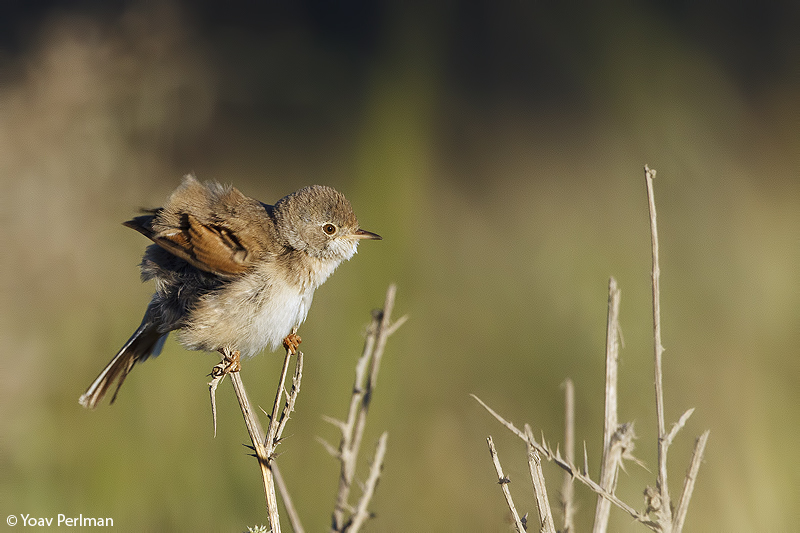 Most prominent were Spectacled Warblers - I had five families with fledglings. 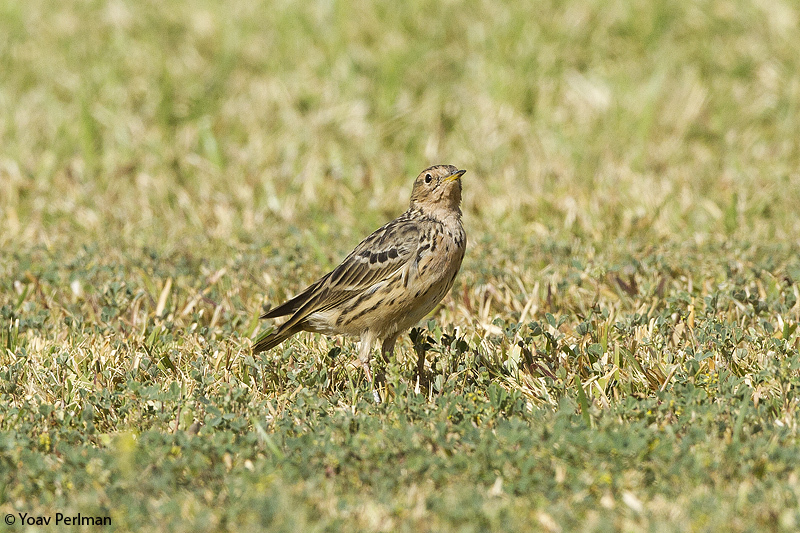 I found no Long-billed Pipits, but I did have a singing and displaying Tawny Pipit. 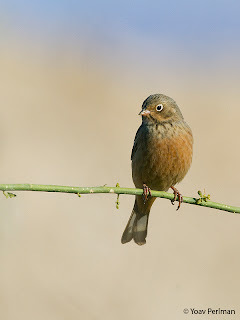 I will need to check for more signs of breeding later on in the season. 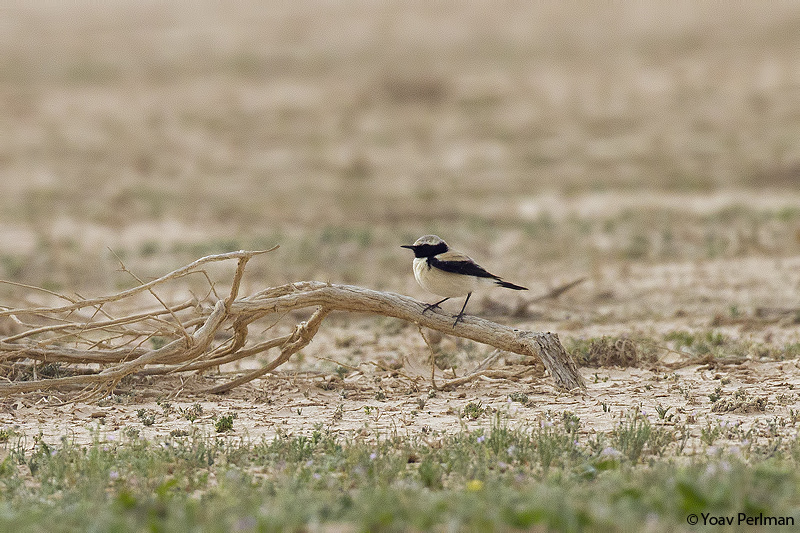 In addition I found a nest of Black-eared Wheatears, and had two singing male Hill Sparrows - one was with a female on a nest. 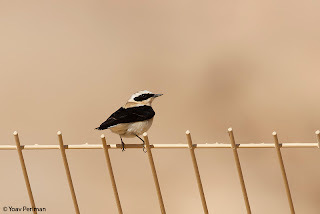 First breeding record for the greater Be'er Sheva region. 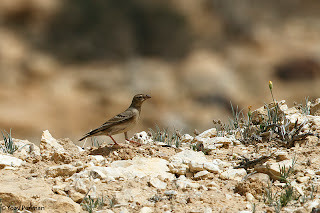 Another good bird I had was a pair of Desert Larks. After returning from the festival stayed at home for a day or two catching up on emails etc. 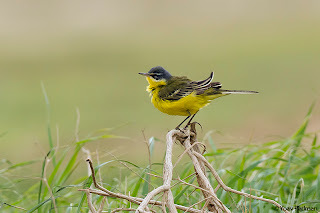 Weather in March is very unstable here, and its effects on bird migration were evident in recent days. 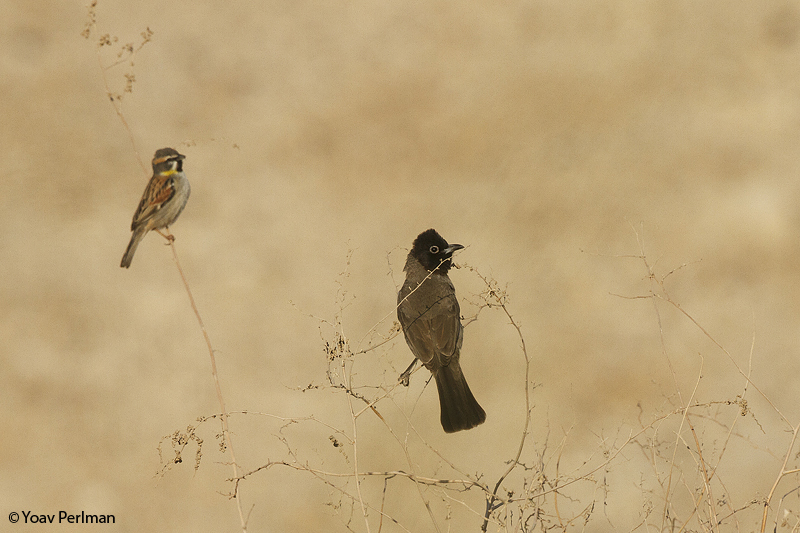 Yesterday we had a dramatic sandstorm accompanied by mighty easterlies. 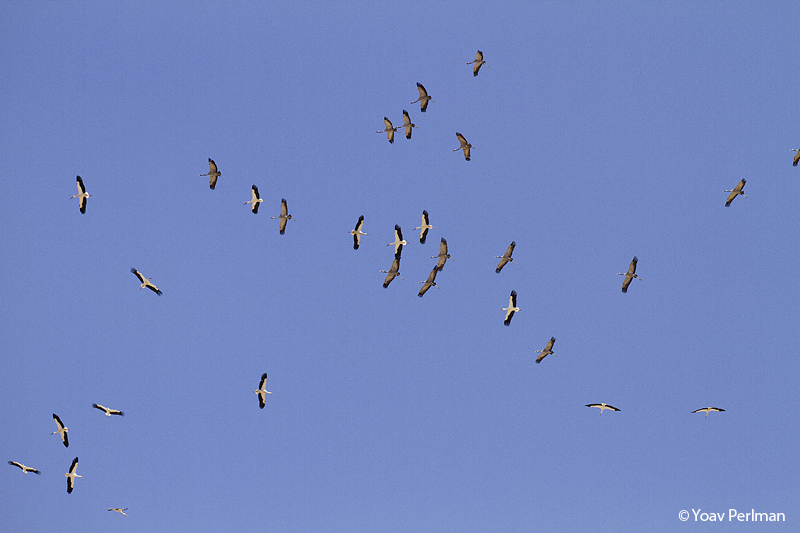 Before visibility became almost zero, I had good raptor and stork migration over my house. 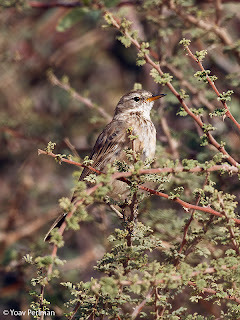 In the afternoon the weather changed abruptly, and almost at once winds changed to westerlies and temperatures dropped by 10 degrees. 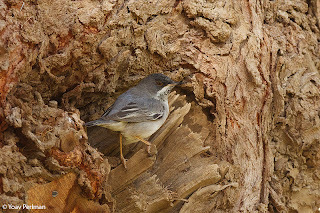 This morning the trees in my village were just packed with sylvias and Balkan Warblers. 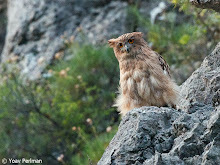 In the evening a successful night tour with good views of nightjars and owl. 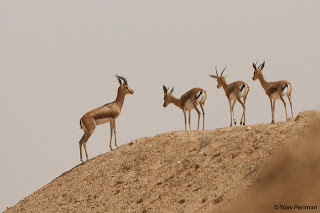 Eilat Festival days 6 & 7 - rambo tours! Got back home late last night - only now I have time to write about the two very intensive but highly rewarding days. 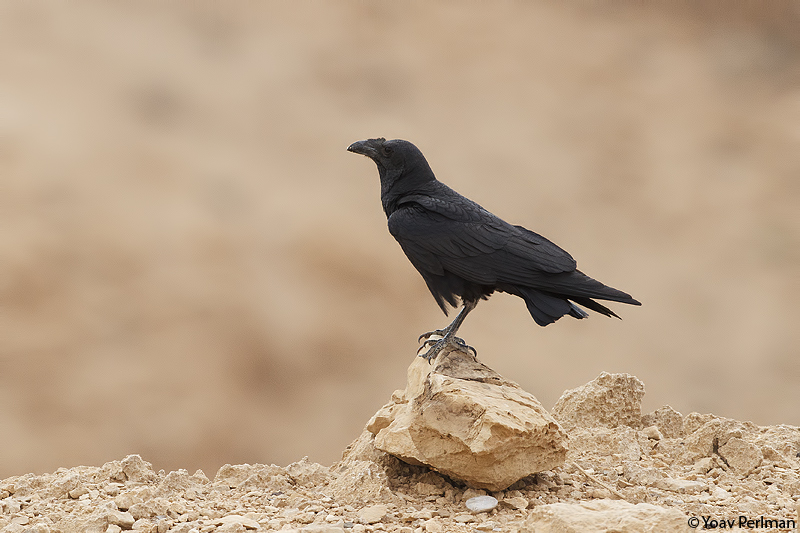 On Monday I led the Dead Sea Rambo tour with Meidad. 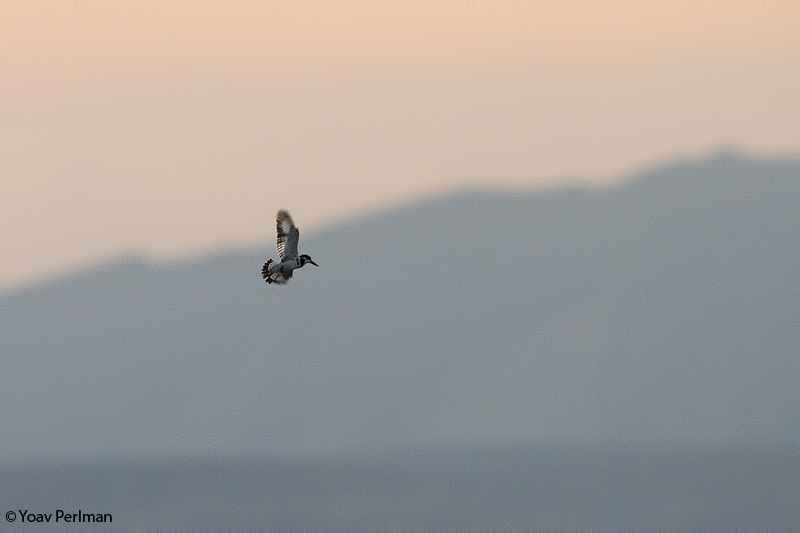 We left Eilat before dawn, and early morning we arrived at Metzoke Dragot to witness the massive raptor migration there, like Noam had had with his NABU group on previous days. 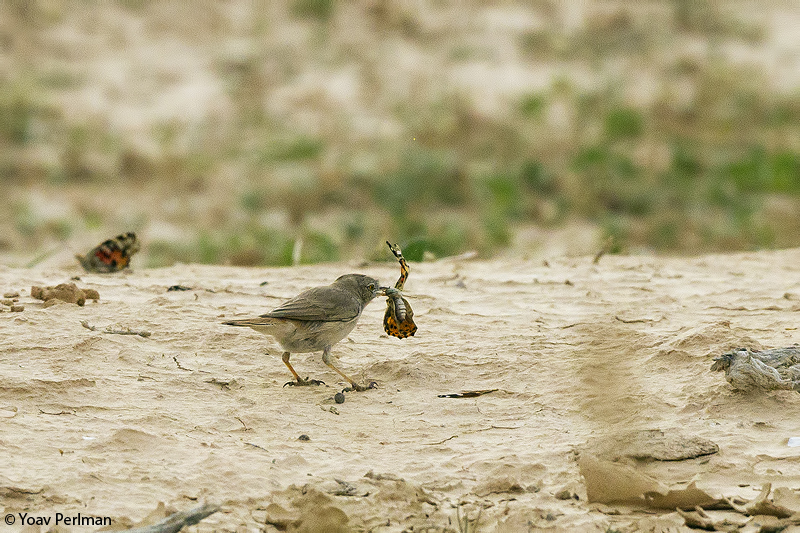 But Mr. Murphy worked extra hard, and we had almost no raptors whatsoever, only some local breeding Eurasian Griffons, Egyptian Vultures and Short-toed Eagles. 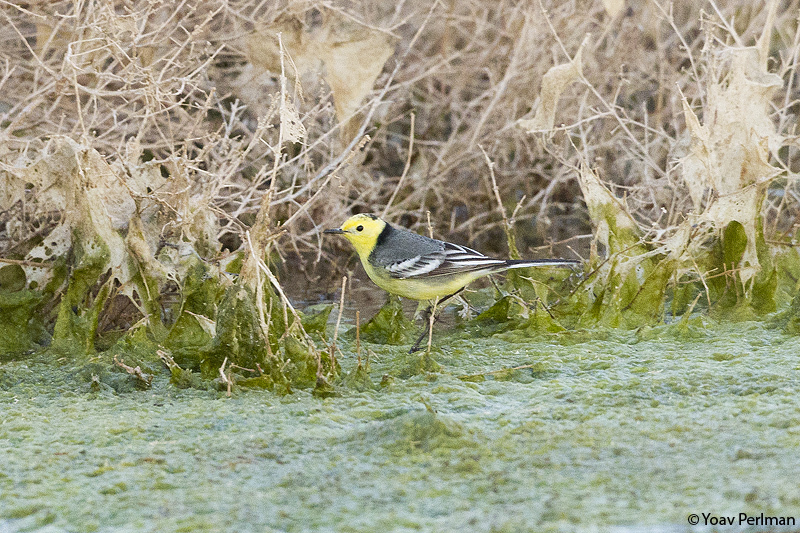 But there was still some good birding to be done in the area. 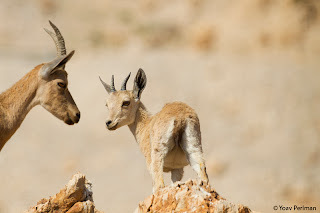 Nubian Ibex were presnt in good numbers, mainly females and cubs. 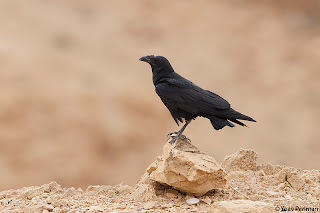 Common desert species such as Fan-tailed Ravens, Scrub Warblers and Trsitram's Starlings preformed well near the village. We then went to the watchpoint overlooking the Darga gorge. 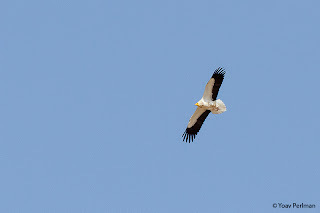 We saw two Bonelli's Eagles - an adult male and a 2cy, interacting, flying, landing, collecting fresh nesting material - very good action. 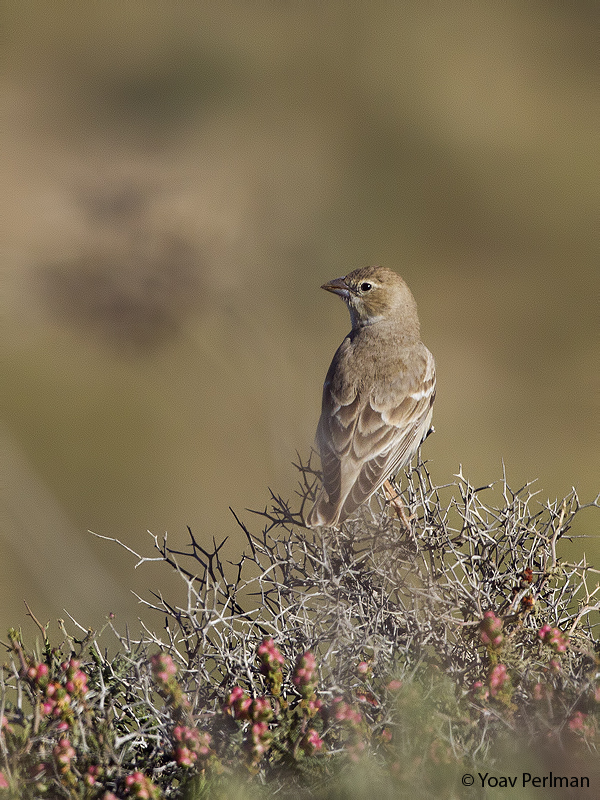 On the same hill, as usual, we had a singing male Striolated Bunting. Great stuff. 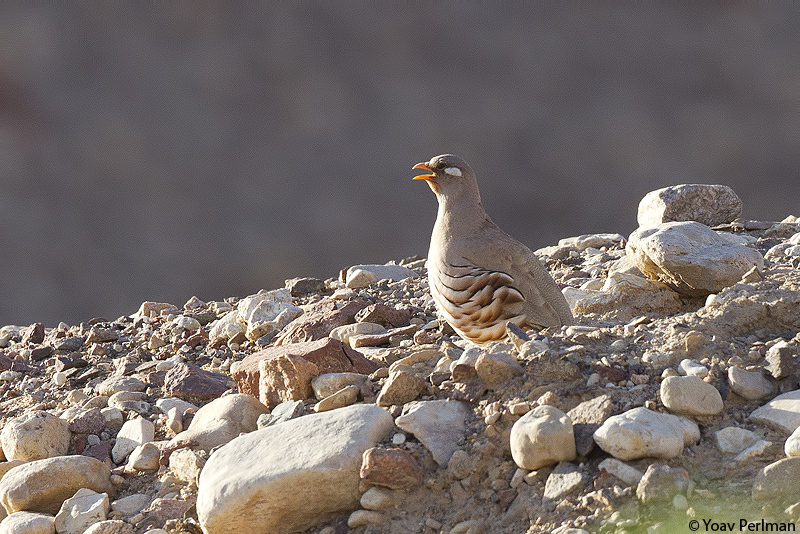 After a lunch break at Ein Gedi, where we added Rock Hyrax to our mammal list and Bllue Rock Thrush to our bird list, we went to wadi Mishmar. 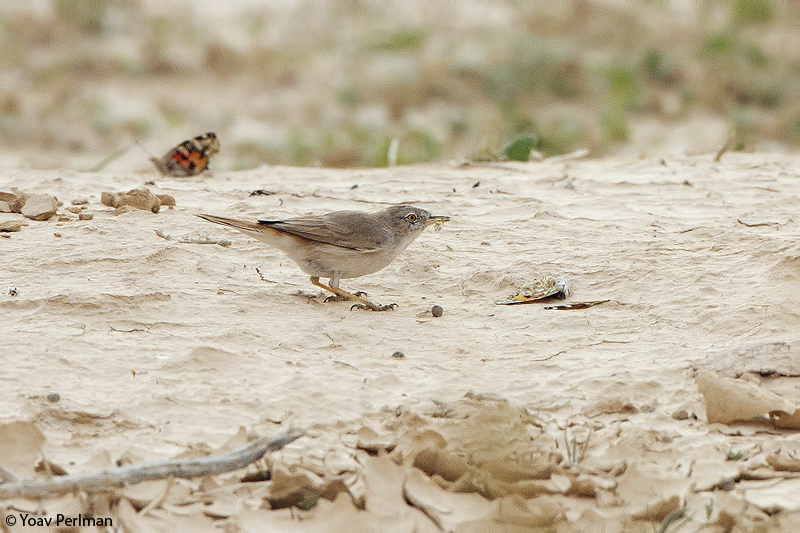 It was hot and rather quiet but still quite a few migrants around. Noam tipped me off on a purple patch at Heimar reservoir south of the Dead Sea. We arrived there in the afternoon and had a really good time. 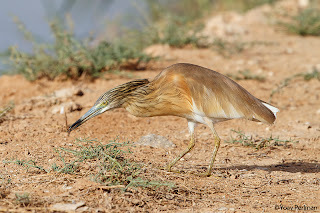 Very birdy site indeed with some quality stuff. There is a nice colony of Dead Sea Sparrows there - we saw only singing males; I assume the females are on eggs. 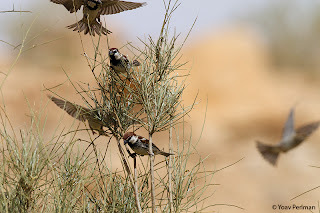 Such lovely little sparrows. Lots of other good birds there, including Caspian Stonechat, Subalpine Warbler, two Citrine Wags, Clamorous Reed Warbler etc. 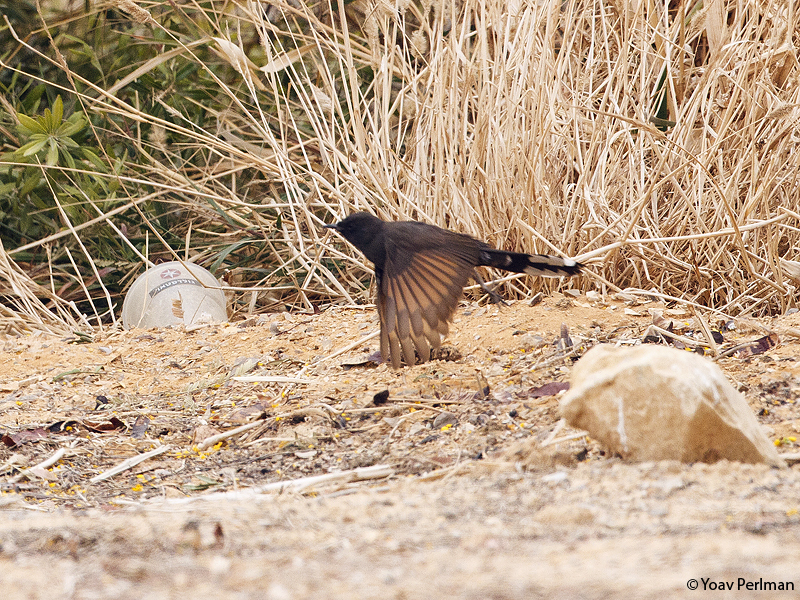 In the photo above the tail looks completely black, but when he spread the tail much white was evident of TF. 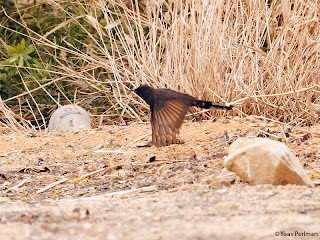 Before dusk we arrived at Neot Hakikar. We checked a good site where we had three singing Clamorous Reed Warblers. 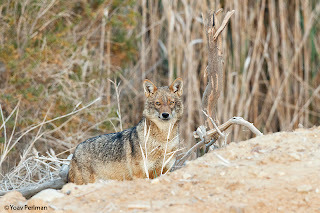 A Golden Jackal was very curious about us. 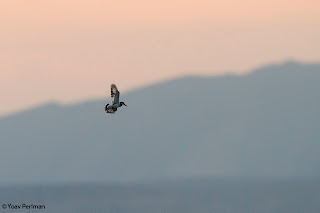 A Pied Kingfisher was hovering against the pink sky. Very special atmoshpere. After dusk we found Nubian Nightjars very easily and our group enjoyed great views of these rare birds. 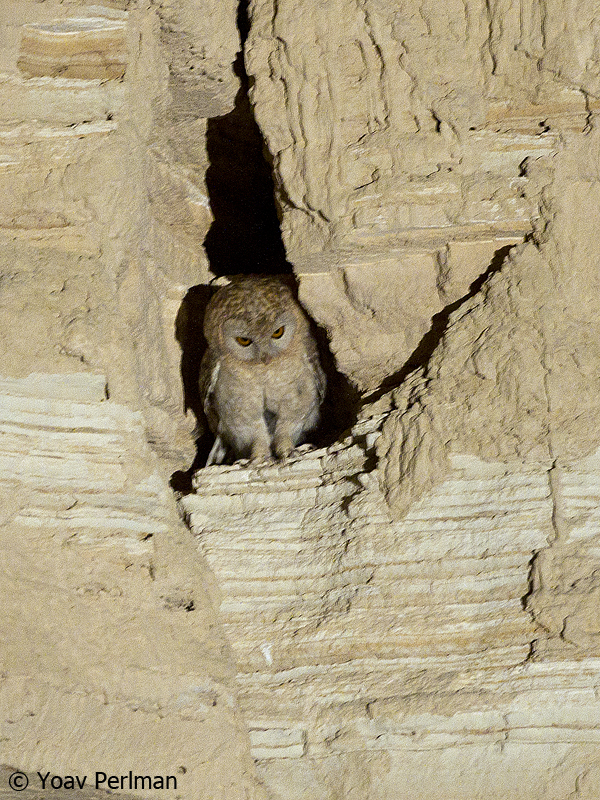 We then headed to a wadi in the Judean Desert where we obtained a permit to search for Hume's Owls. 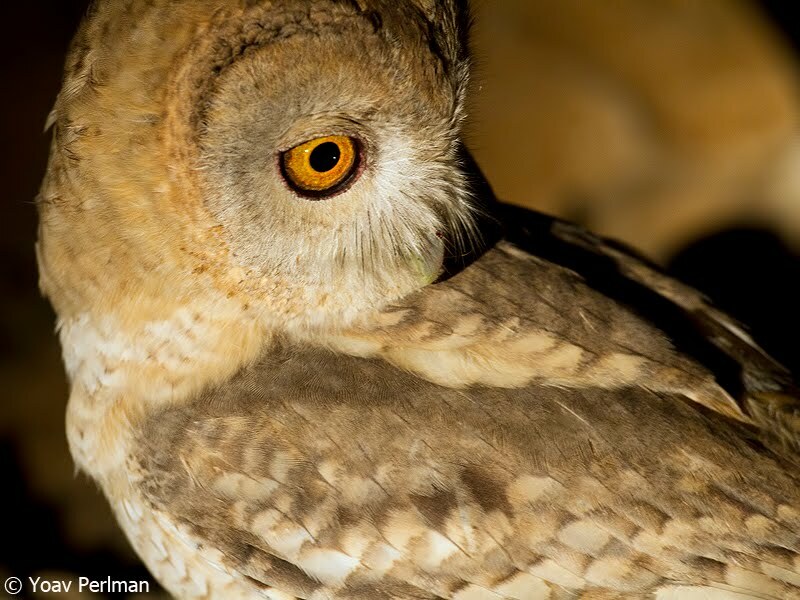 It was actually super difficult - tough walk in the dark, long search, deminishing adrenalin levels, but eventually presistence and perseverence paid off, and we had breathtaking views of a male Hume's Owl - wow. 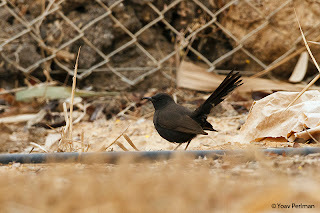 We returned to Eilat almost 24 hours after leaving, exhausted but very satisfied. 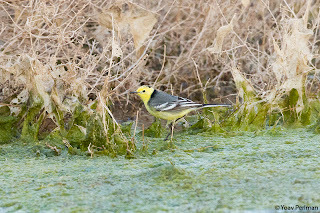 Next morning was one of the most embarassing moments in my birding career. 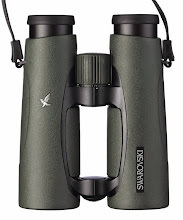 After very little sleep, I woke up at 06:30 from a phone call from two European birders: "we've just found an OBP at imax park". 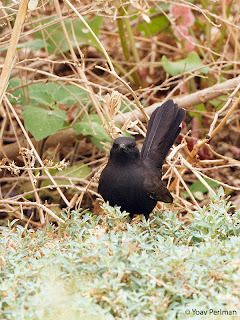 Half asleep I grabbed my bins and camera and headed over. 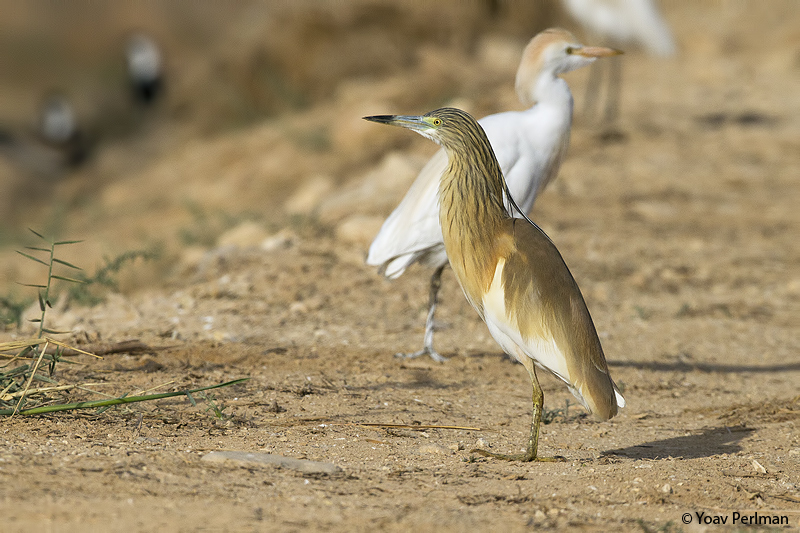 A small crowd assembled, including some of Europe's finset birders. 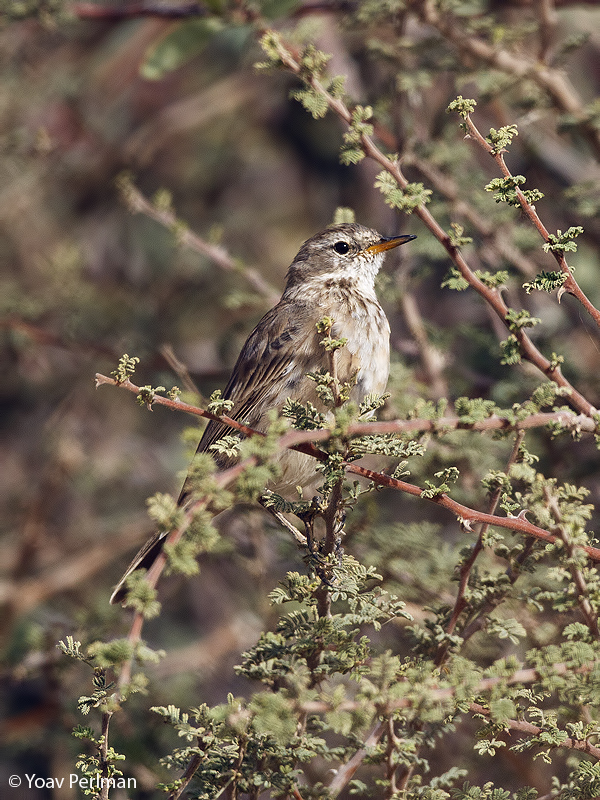 We all watched a perfect Tree pipit, but because we had a pre-conception of OBP, and we were really eager to see a good rarity, we all dismissed the doubts in the back of our heads and said nothing! We discussed the amount of variation in OBP, especially after the bird flew up to a tree and gave a good OBP call, and were all very pleased. 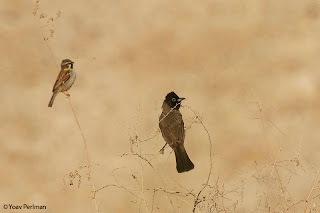 Only when I had my first coffee of the morning I understood what an idiot I was after reviewing my images. Lesson learned I hope. In the afternoon headed north for another rambo tour. On the way out of Eilat got a tip from an English friend about a day-roosting Pharaoh Eagle Owl just north of Eilat. 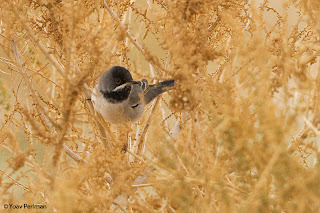 I found the bird easily thanks to the very percise directions, and later on all Festival tours saw the bird (thanks Chris). Fantastic! 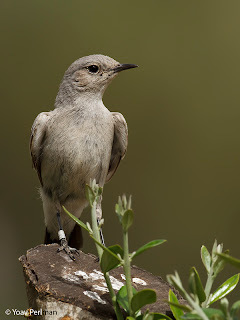 In the afternoon I met the Sunbird group led by Paul French. We checked again the Heimar reservoir site - still very good with little change from the day before. We met up with Jonathan who was with the Festival group, and this time we did the Hume's Owl first, in a different wadi. 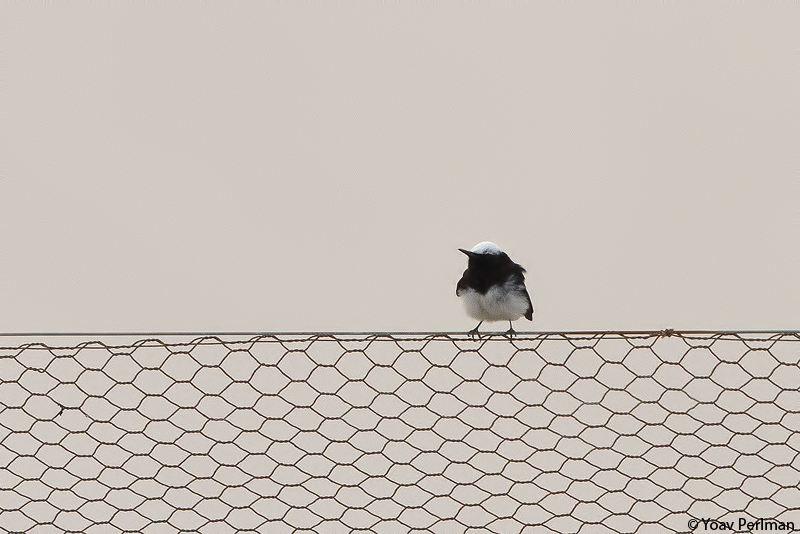 It worked really well and easy this time - we had extraordinary luck watching a pair interacting, calling, flying back and forth. Wow again. Then down to Neot Hakikar. 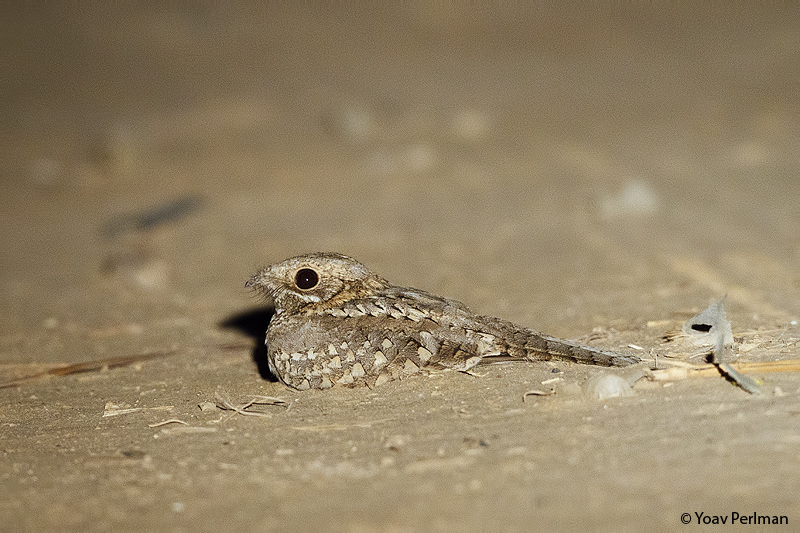 Nubian Nightjar was easy again; in and out in a few minutes. Quality birding. That ended my role in this year's festival. Many thanks to all the festival guests - it was a real pleasure to meet you guys. Special thanks to the festival organizers and co-leaders - Dan, Itai, Jonathan, Meidad, Noam and Yuval. 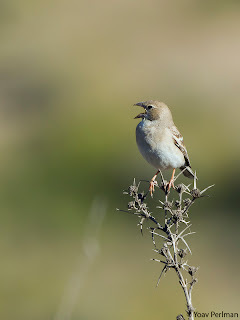 Here you will see how I take images from a rather slow day to create an interesting post. 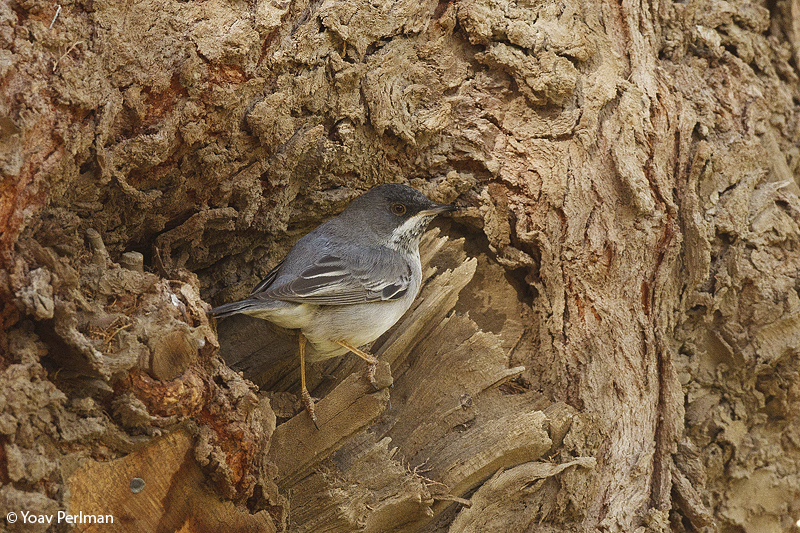 Spent the morning birding with Meidad. We had high expectations after yesterday, but today materialized to be another migrant-less day. 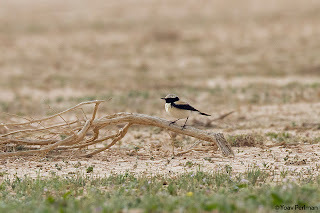 On the way to Yotvata Meidad spotted a Hooded Wheatear sat by the road. Very nice. At Yotvata few migrants, only the sewage ponds had some birds including Squacco Herons. Listen to this sound-recording of samamisicus - so distinctive. This one's for you Martin. Lotan was very empty too, only one Red-throated Pipit there. 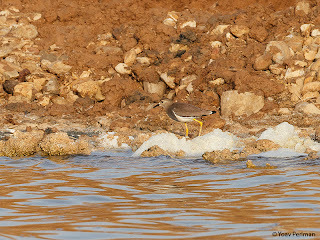 It had a ring on - probably had been ringed there in previous years. 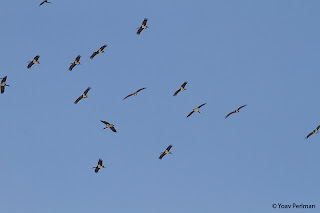 A flock of 60 Black Storks going over was nice to see. Mammals today included Dorcas Gazelle and Cape Hare. 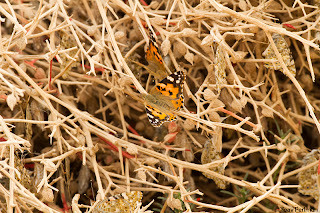 Painted Ladies - so many in one frame! Very satisfied we left KM76 and headed over to Yotvata. 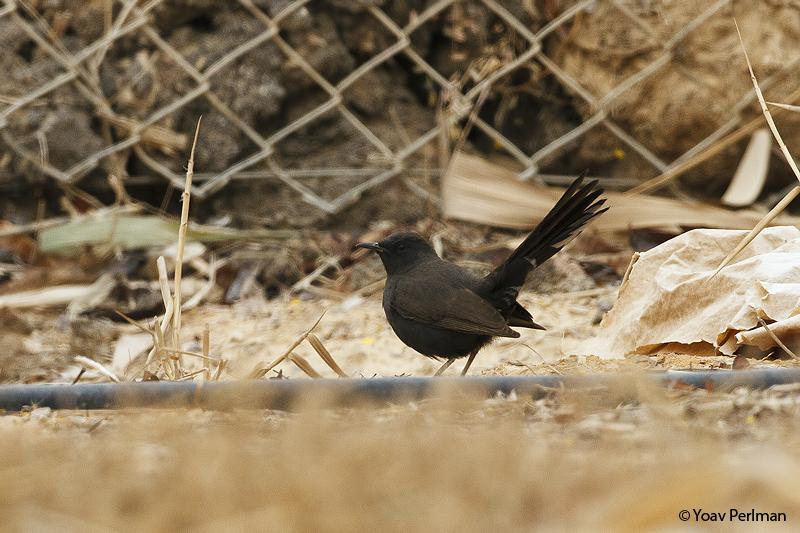 While having breakfast at the cafe, we received a call from our Finnish friends Mika and Erkki that they had just found a Black bush Robin at Neot Smadar sewage. 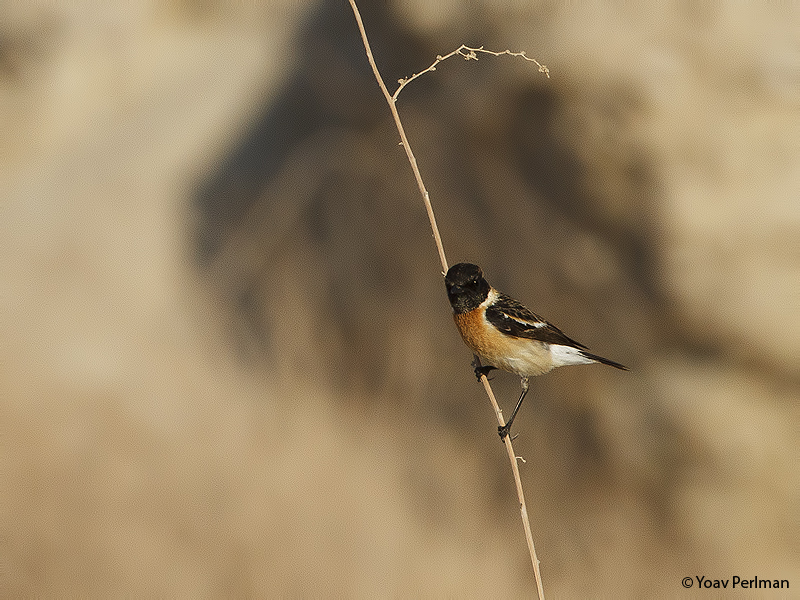 Without thinking twice we quickly packed up, deserted our plans for birding in Yotvata and headed there. By the time we got there the Finns had already found a second bird, 100 m away from the first one! 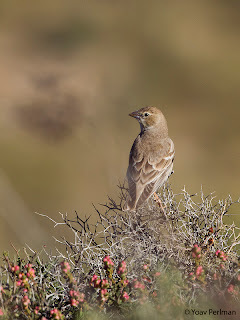 We got on to both birds very quickly, and the whole group had great views of these charismatic birds. 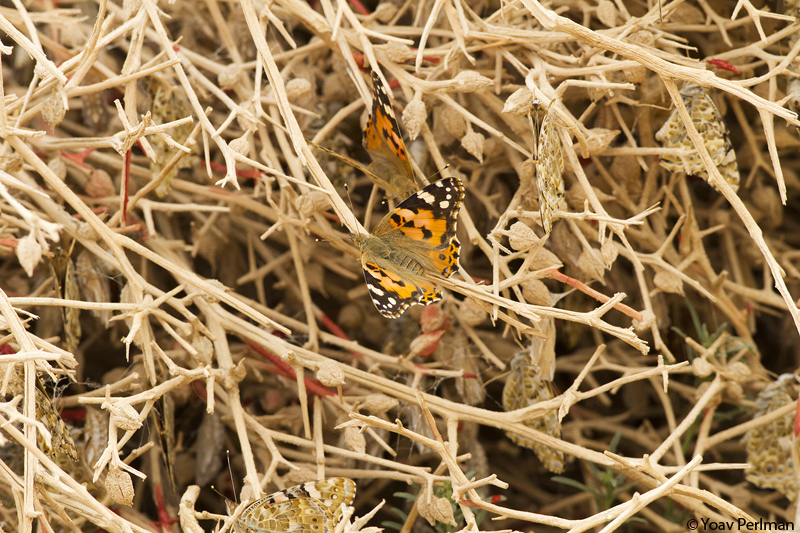 I am really pleased we saw them during the festival. They are really one of the festival's iconic birds, and of course it was a lifer for most of our clients. I wasn't able to take any proper photos with 50 birders walking behind me. Maybe I'll improve tomorrow. 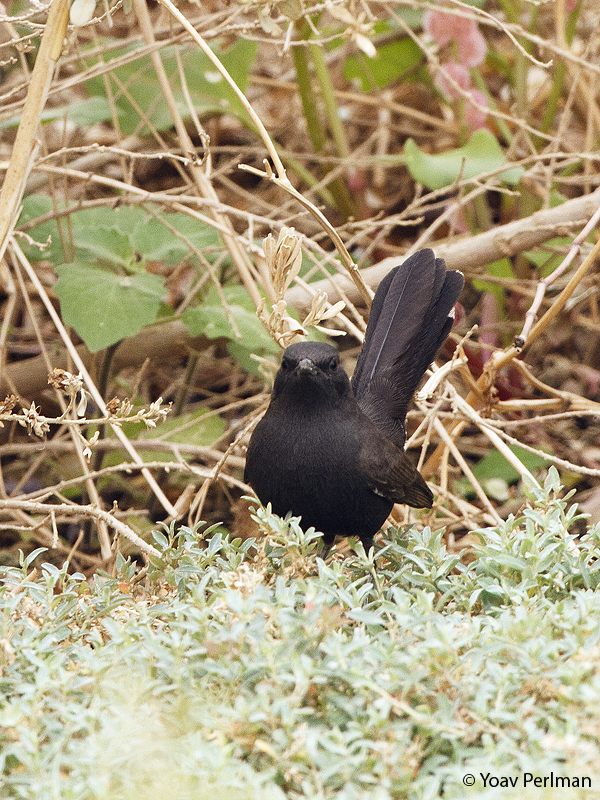 After we all had enough of these black beauties, we headed back to Yotvata. 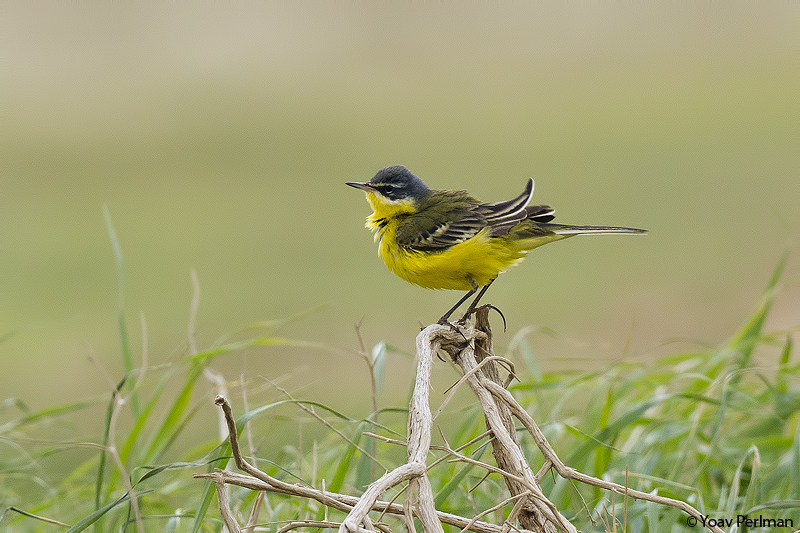 While driving south i got a phone call from some Dutch birders (sorry guys - didn't get your names) who informed me of a third bird in that beautiful canal south of KM20 saltpans. Amazing! 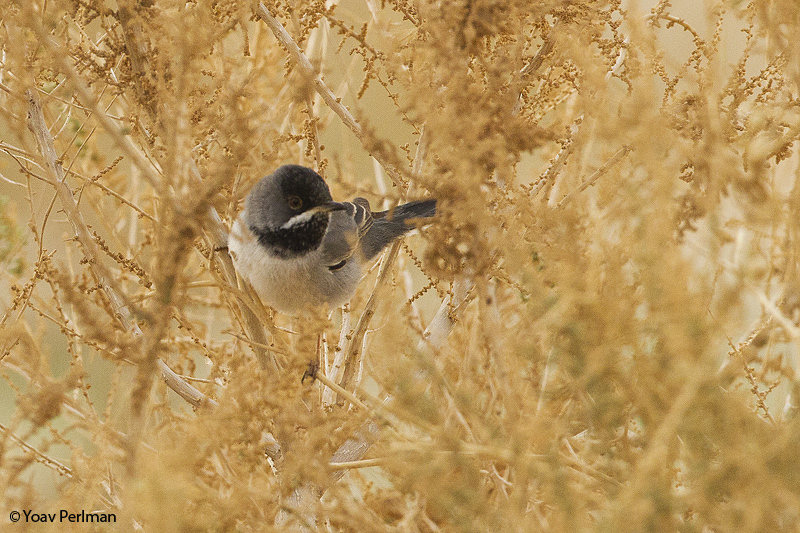 We spent some time looking for Arabian Warbler near Yotvata without success. 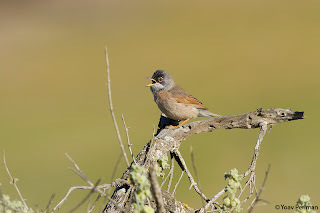 Just as I called the group back to the minibus, I heard a male singing. 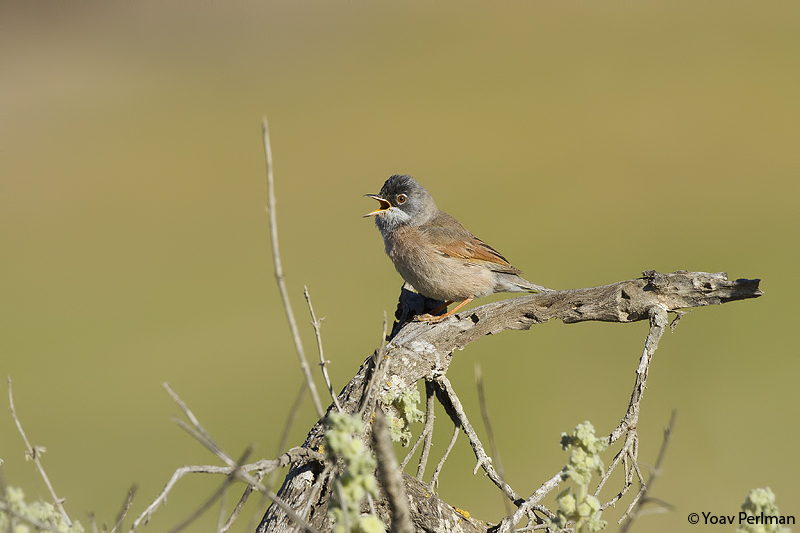 I looked back and a few clients who were near me had great views of a male singing from a treetop! 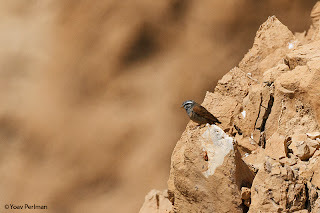 Unfortunately not all the group managed to get good views. We will try again tomorrow. After short siesta, we headed out again in the afternoon. 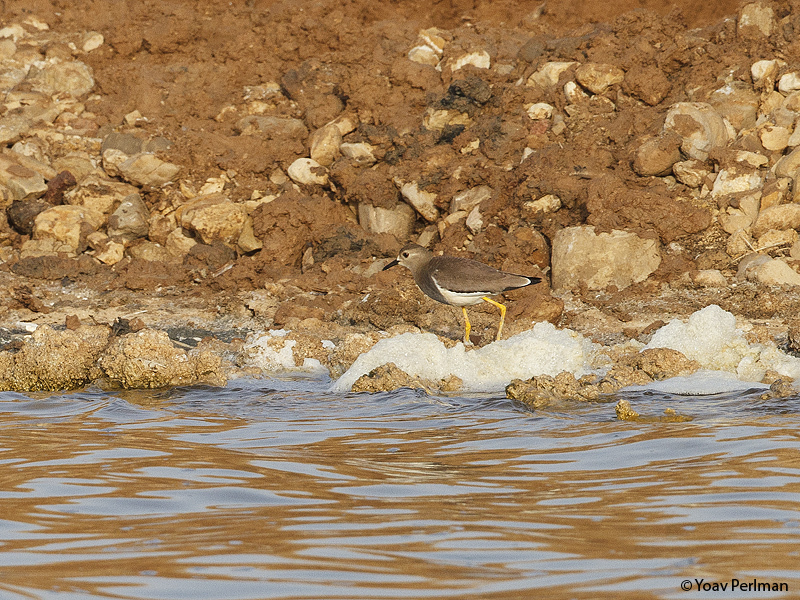 First checked the saltpans where we had two Siberain Gulls, four Gull-billed Terns and the White-tailed Lapwing was showing nicely in the southern end of the ponds. 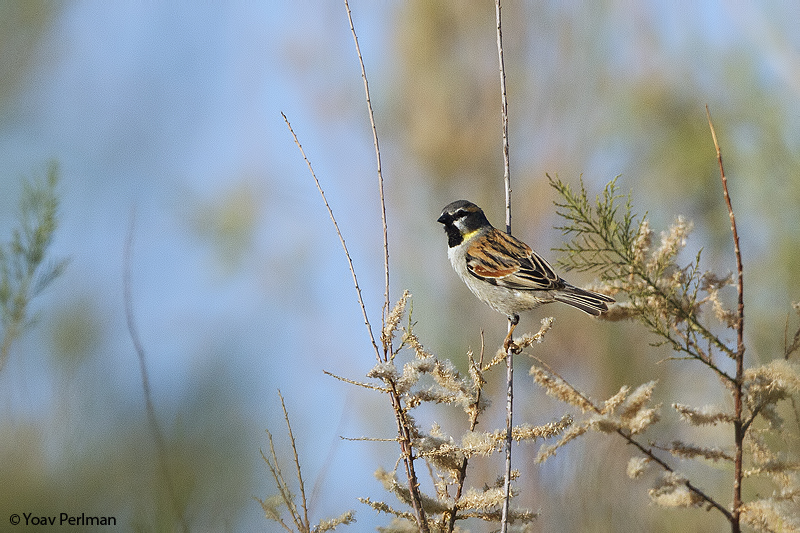 Yet another quality bird today. Before dark spent some time at north beach, nothing special or new. Good night. Led the Nizzana tour today with Meidad. Left Eilat at 04:00. 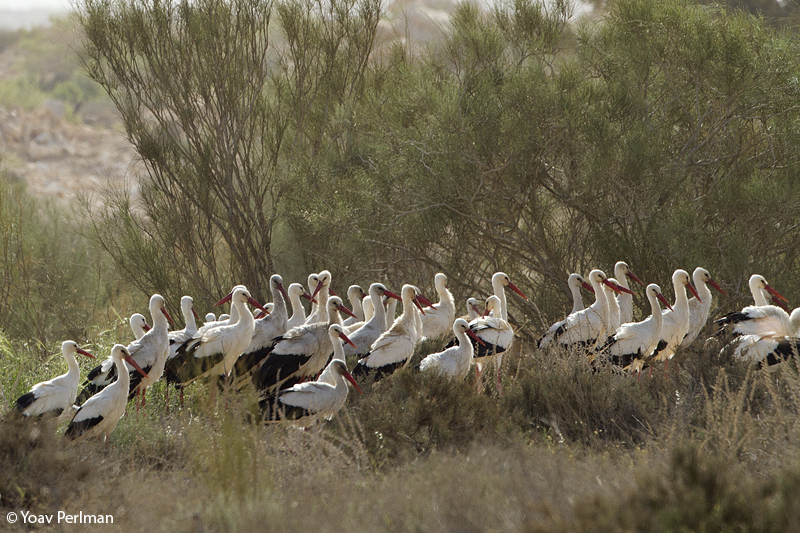 We arrived at Nizzana a bit late but started seeing birds immediately. 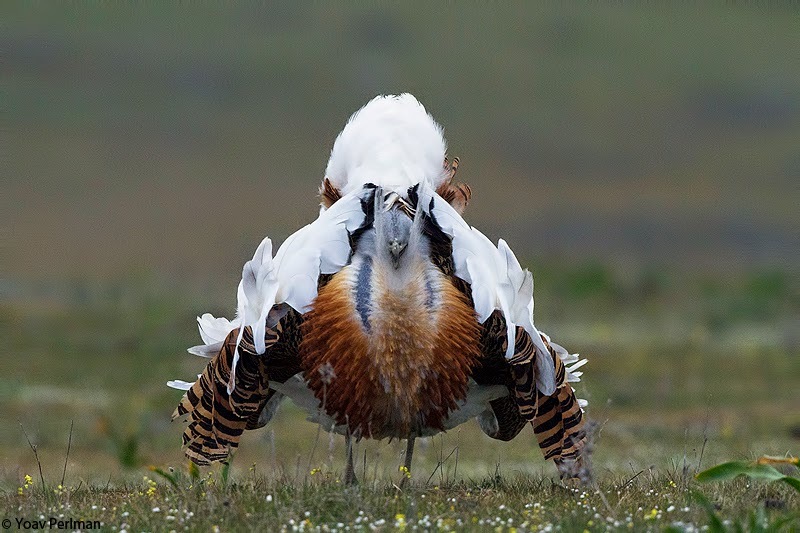 It took me about 10 seconds to locate a dancing male MacQueen's Bustard, and the next hour was truly magical - so many birds that the tour participants didn't know what to look at first. We had at the same spot two hilarious dancing bustards, four Cream-coloured Coursers attacked by a superb male Pallid Harrier, Asian Desert Warbler, and Pin-tailed and Black-bellied Sandgrouse. 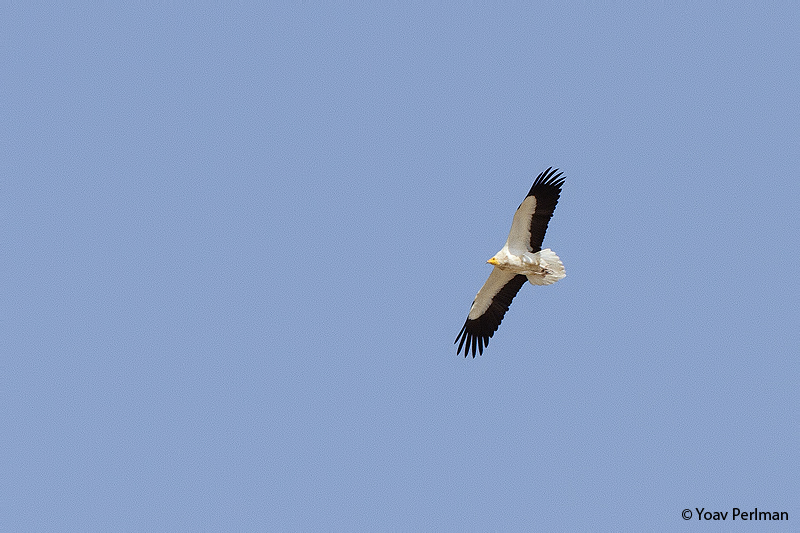 Overhead good migration started off - many raptors including Steppe, Lesser Spotted, Booted and Short-toed Eagles, Egyptian Vulture and Alpine, Pallid and Common Swifts went overhead. 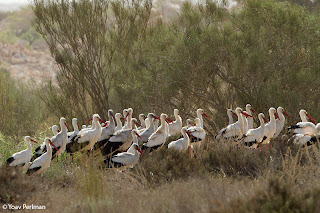 Then we started driving towards Ezuz, where we saw a huge take-off of White Storks (about 1000), some of them returned to drink in a small waterhole. 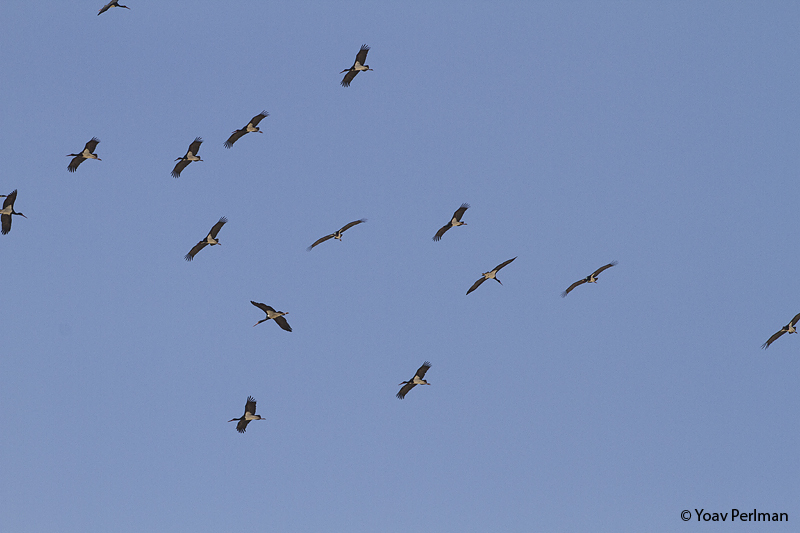 Then they all took off, and were joined by a small group of Eurasian Cranes. 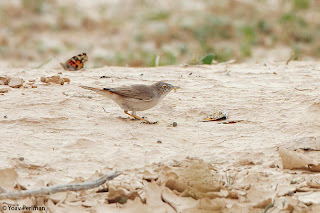 At about 09:30 the weather deteriorated and a dramatic sand storm began blowing hard, slowing our birding considerabely. 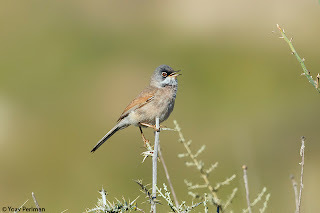 However we stayed near that waterhole a little longer where we had quite many Hill Sparrows coming in to drink, with additional birds there being some large flocks of Spanish Sparrows, Cretzchmar's Bunting and Eastern Black-eared Wheatear. 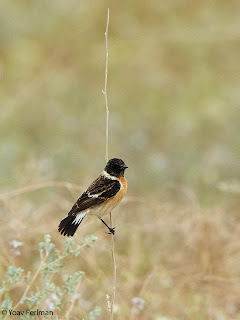 We checked some more sites near Nizzana. 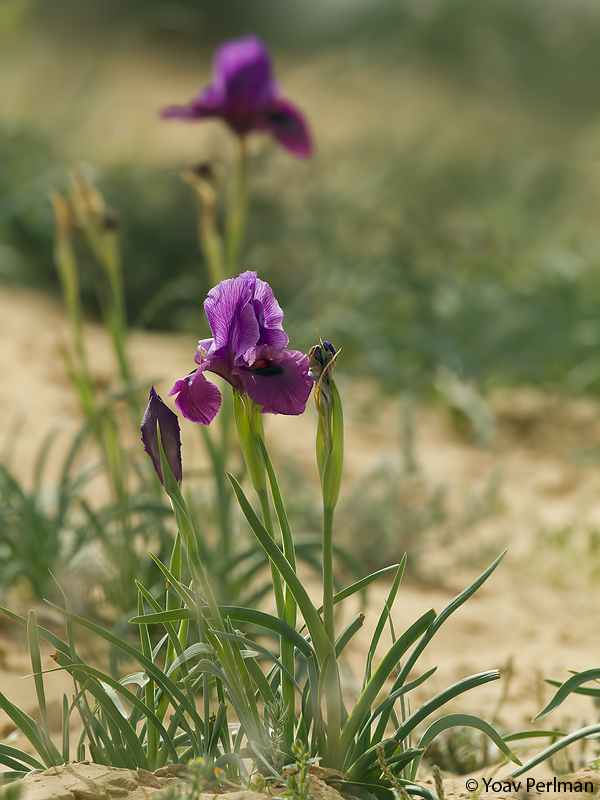 Didn't see too much else but found some Dorcas Gazelles, and had a nice group of Negev Iris. 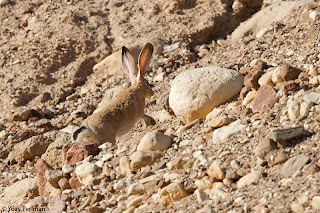 On the way back to Eilat we stopped at Sde Boker which was very productive. We had there typical desert species such as Arabian Babbler, Tristram's Starling, BlackStart etc. 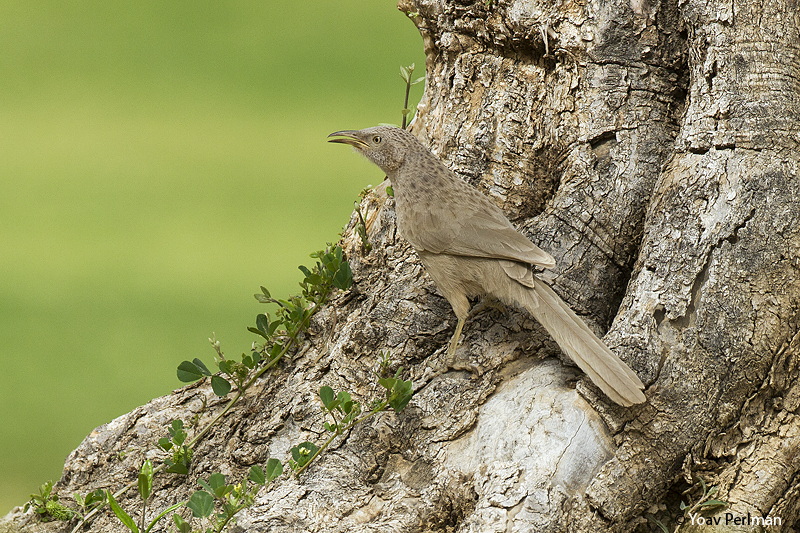 The babblers were really entertaining, hopping on the ground near us looking for grubs. A flyby Eurasian Griffon was cool just as we drove out. Got back to Eilat tired but very satisfied. 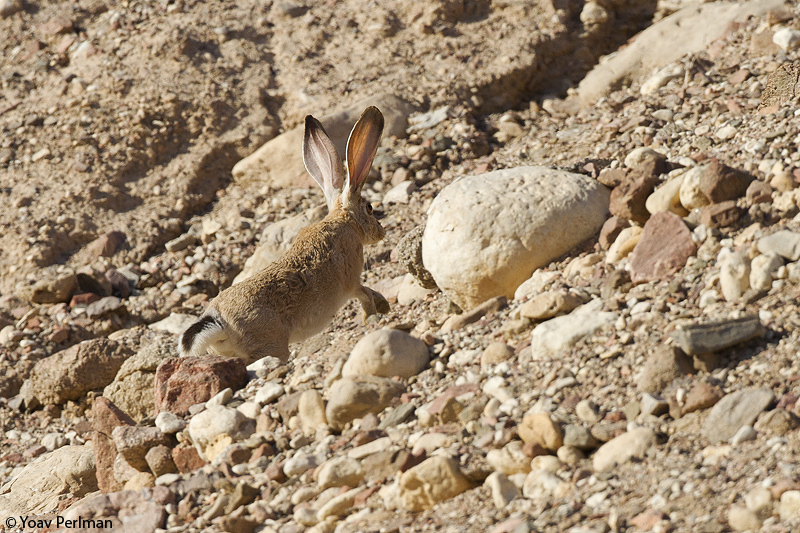 Eilat Festival day 1 - new to science?